The Guide\xCDs Choice has been reimagined to exceed the needs of our most demanding customers. Incorporating our most advanced eyewear technologies, this style boasts wide temples and an aggressive wrap for superior light protection. 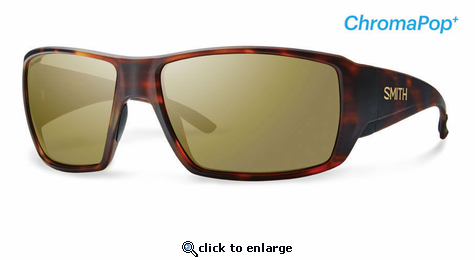 Add to that premium Italian spring hinges, megol nose and temple pads, a detachable sunglass leash, and premium 8-base ChromaPop and Techlite glass lenses, the Guide\xCDs Choice is engineered for those that truly believe in the life outside walls. When light passes through a medium it refracts, i.e. changes course. If left uncorrected, this refraction can cause visual distortion and eye fatigue. Smith\xCDs Tapered Lens Technology straightens out the incoming light rays by progressively tapering the lens from the optical center toward the peripheral view. What this means for you is that you see with 100% accuracy and maximum comfort. Based in Sun Valley, Idaho, Smith Optics, Inc. was founded in 1965 with the creation of the first-ever goggle featuring a sealed thermal lens and breathable vent foam. This invention would revolutionize the powder skiing experience and make Smith Optics a worldwide brand in the years to come. In the early days, founder Dr. Bob Smith, a dentist by trade, made goggles by hand using dental tools, foam and glue. Before he struck a deal for the manufacturing of Smith goggles in the late 60's, Smith built early prototypes with friends around the kitchen table and would often trade these creations for lift tickets while traveling to test the goggles out. From Smith's ultimate integration between goggles and helmets, to the unmatched clarity of the ChromaPop lens, its' devotion to excellence, innovation and style has made Smith goggles, helmets, and sunglasses the choice of action-sport athletes worldwide. Smith products represent authentic sports gear, researched and tested by a dedicated group of employees and athletes that live and breathe the lifestyle. It\xCDs easy to make great product when you love what you do.